1. You will be able to enjoy Xbox Live Online options and play free games in Game In Gold function. 2. It's a 25 digit code, application to all version console( Except China). All account acceptable. 3. Please make sure you don't have any XBOX LIVE Gold Membershi available in your account before you make purchase. On console: Please access to Microsoft Store on your Xbox, Click on "View All Games", type in and redeem code on the top of the right side. Click on "Redeem code" on the top of the right side after logged in, type in 25 digit code then confirm. 1. 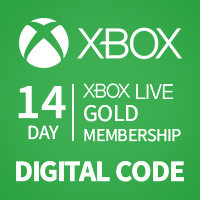 Q: Is it possible to use XBOX LIVE 14Days Gold Membership code multiple times? I want to keep using the membership. A: Yes, it is possible, you can buy another 14 Days code when your previous membership expired. It is recyclable. 2. Q: Is there any difference between 14 Days Membership and 1 month Membership? A: No difference, all the same. Looking for a sale to Buy Xbox Live Gold - 14 Day Gold Subscription Card? Look no further because Joymmo.com's Game Store has the cheapest offer you'll never find anywhere else. 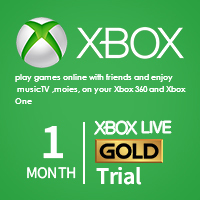 The Xbox Live Gold 1 Month/3Months Subscription card is good for activation with both Xbox One or Xbox 360 since it is just for the Xbox Live service and is not limited to one video game console type. By using a Xbox Live Gold Subscription Card you'll get a lot more by going gold! You'll have a lag free multiplayer experience. You'll have access to free games and by being a gold member you will get massive discounts on some of the newest titles to come into the Xbox library. 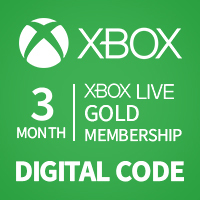 By being a gold member with Xbox Live using the Xbox Live Gold Membership Subscription Card you can enjoy a lag free and cheater free experience while you play video games with your friends or strangers online. We use the cloud to eliminate any lag while you play your game with anyone even if he or she is across the globe. We also have faster matchmaking within our Xbox live gold member server rooms. So you'll get what you paid for!